Contact Palm Beach County, Florida Personal Injury Lawyer Gerson & Schwartz, P.A. Whether you are in Boca Raton or any other part of Palm Beach County, you deserve to feel safe when you go out. Accidents that suddenly occur can throw you off of your routine and alter your plans significantly on top of negatively affect your finances. If this happens, you will need to consider alternative means to pay for the expenses associated with your injuries, such as holding a liable party financially responsible for the accident. This is where a personal injury claim may help you relieve some of the burden placed on you by the accident. Once you are no longer worried about monetary concerns, you will be able to focus on feeling better. Here at Gerson & Schwartz, P.A. we want to help you recover from the injuries caused by an accident. If you are a victim of an accident, you should consider the option of filing a personal injury claim. Personal injuries vary in severity, and can range from whiplash to a spinal cord injury. Injuries that occur from someone else’s negligence, such as a cruise ship accident, car accident, slip and fall, dog bites and medical malpractice, are considered personal injuries under the law. By filing a claim, you will show the negligent party that you will not be taken advantage of. Our experienced legal attorneys have handled many personal injury cases in the past and we want to help you. After a free consultation, we will diligently prepare your case for negotiation or, if necessary, for trial. We will gather evidence, testimony from witnesses present at the accident and expert witnesses, and prepare legal paperwork. We will not add to your financial burden, as we will only get paid if you do. So call Gerson & Schwartz, P.A. today and let us help you with your personal injury claim from start to finish. Boca Raton, a city in Palm Beach County, Florida, has a total population of 84,392 according to the United States Census Bureau 2010 report. The city’s name is Spanish for “Rat’s Mouth” but the original name “Boca de Ratones” referred to “rugged rocks or stony ground” describing its original location. The name eventually moved upward into the land and changed to its current meaning. 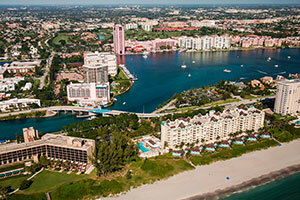 Boca Raton is considered the largest city between West Palm Beach and Pompano Beach. The population increases significantly during the day as many people commute into the city to conduct business. Businesses such as IBM have been around since the 1960s and help to promote the economic and business development within the city. IBM created their first personal computer (PC) in a research lab that is now the Boca Corporate Center and Campus. The city is also home to Bluegreen Corporation, a real estate and timeshare resort developer, since 1966. People enjoy visiting Mizner Park for its amphitheater and downtown outdoor shopping and dining center. The city is also known for its National Cartoon Museum and Town Center Mall.